Yesterday, as I’m sure you heard, the House defeated the $700 billion bailout. Although the stock market suffered quite a hit, I think we will recover in time. That seems to be the trend. Some days we go up and some days we go down. Admittedly, every now and then the bumpy nature of the ride with huge rises and falls can send people scrambling to the sidelines, but, I believe as long as we trust the free market, we will continue to prosper in the long run. Unfortunately, not everyone shares this viewpoint. They wring their hands and clamor for a short-term fix. Why is it these days that whenever a problem emerges, so many people run to the federal government looking for solutions? Even more depressing is the fact that so many politicians are chomping at the bit to usurp more power at the expense of the free market, liberty, and the Constitution. Congress and the President call for more oversight of the financial markets, but then the greater question is, who reigns in the government? Do we allow this watchdog to roam free, tearing up someone else’s property and rooting around where he doesn’t belong, all in the wistful hope of financial security? As you can rarely trust the government to stay within it’s proscribed powers, the job has fallen primarily to the people themselves and too many of us have fallen down on our responsibility. As you know, I, for one, will not remain quiet. Looking over the list of members of the House of Representatives, let us see who voted correctly. 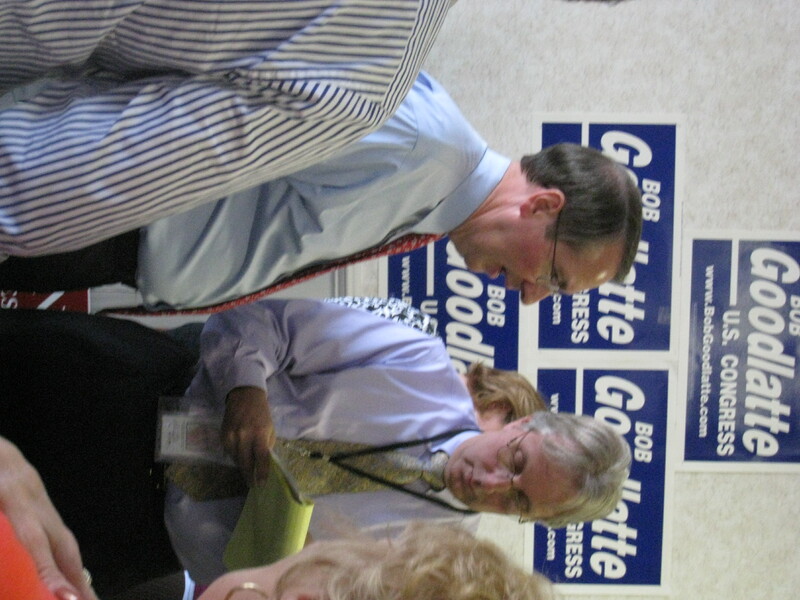 For Virginia, my Congressman, Bob Goodlatte voted no. So did the 5th’s Virgil Goode, the 2nd’s Thelma Drake, the 1st’s Rob Wittman, the 4th’s Randy Forbes, and even the 3rd’s Democrat Robert Scott. In support of the unconstitutional measure were Democrats Moran and Boucher (no surprise there), but also Republicans Cantor, Wolf, and Davis. If you happen to live in 7th, 8th, 9th, 10th, or 11th districts and disagree with your Congressman’s position, I strongly encourage you to hold your Congressman’s feet to the fire and call him today. For your convenience, Eric Cantor’s number is 202-225-2815, James Moran is 202-225-4376, Rick Boucher is 202-225-3861, Frank Wolf is 202-225-5136, and Tom Davis is 202-225-1492. I warn you that if we do not hold them accountable, they will try again. From my experiences at the local GOP Headquarters, my suspicions about the presidential race have been confirmed once more. This election is about fear, pure and simple. I feel as if I’ve fallen into the world of Machiavelli’s The Prince. If you will recall, Machiavelli teaches that in order for a leader to be successful he needs to inspire either love or fear. Let me examine the McCain side of things. I think that we can agree that most Republicans don’t truly love McCain. They may respect him, they may like him, but very few actually love him. Now by love him, I mean that they greatly want to see McCain in office (as opposed to any other Republican) and are willing to give of their time and money to see him succeed. Therefore, he has to resort to the other path to success, fear. Now using fear in our quasi-democratic system is a good deal different than in Machiavelli’s time. Rather than a leader inspiring fear among his subjects, in our society, fear is used as a tool to demonize one’s opponent. Think about it. Have you heard more arguments in favor of John McCain or those against Barack Obama? How about when Hillary was the presumptive Democratic nominee? Do you not recall her labeled as the “most liberal” and people making the wild claim that he or she “would vote for the devil himself before they voted for Hillary Clinton”? Now that Senator Obama is the Democratic choice he is the most liberal all of a sudden. As mentioned, I heard an interesting comment recently at the Republican HQ. One person asked about my level of involvement in this race. I stated that I spent a lot of effort back in 2006, and would likely not spend much of my time this year. She said that I should get more involved because, I kid you not, “this could be last chance you have to vote.” Obviously she was implying that if Obama won, either our system of elections would be removed and replaced with a dictatorship or the United States would cease to be by 2012. This kind of fear politics is pathetic. Odds are very low that either candidate will destroy the country, although it is true, they both will likely chip away our liberties and continue to unconstitutionally expand our government. I hope that you have not given into this fear baiting. Although I would argue that more people “love” Obama than McCain, I don’t think either have huge positives. Obama claims to represent hope and change compared to the Bush administration, but really he is an empty suit liberal. McCain tries to play himself as a conservative, but he is a moderate to liberal Republican politician who doesn’t really seem to grasp fully the proper role of government. As has been common in recent contests, they both resort to the fear tactic. Obama will surrender to the terrorists. McCain will give us a century of war. Obama is inexperienced. McCain is a career politician. Obama is worse than Hillary. McCain is four more years of Bush. Obama will kill our unborn children. McCain will take away women’s right to choose. Find the positive statements in this campaign if you can because they will be few and far between. Its not what is so great about either McCain or Obama, but rather what is so awful about his opponent and what terrible things will transpire if he gets into office. The best slogan for each campaign is “at least I’m not that guy”. If only we had decent candidates, we could avoid this year of fear. Well, I’m pleased to announce that we’re up and running again. Although I lost a lot of my data with the death of my hard drive, I was able to recover a good chunk of it thanks to the fine folks at Apple. I’m sorry to say that the article I wanted to post tonight is gone, but many more will replace it. Well, my computer is dead. While using it today, Microsoft Word refused to open. After that, no programs would close without the use of force quit. Now when I turn on my computer all I get is a clicking sound and a blank screen with a flashing question mark. Those people who know something about computers tell me my hard drive is gone. So…looks like I’ll be getting a new one. Good thing it’s still until warranty. I really, really, really hope that they can save all my stored data. Until that time, however, I’ll be without my personal computer. Updates will return when the problem is fixed or when I’m able to borrow another computer (like for this post). Thanks for sticking with me. In the meantime, feel free to leave a comment on any of my writings. Well it is time for me to give my thoughts on the Presidential Race. As you know, I have been an avid supporter of Congressman Ron Paul of Texas. As you might also know, a couple of days ago Ron Paul gave a speech arguing that the public should not support either Republican John McCain nor Democrat Barack Obama. He is right (well…sort of). Conservatives, like myself, have been, at best, lukewarm about the candidacy of Senator McCain. Few, if any of us honestly believe that he is a conservative. Instead he embraces many big government solutions, which are unacceptable philosophically or constitutionally. When endorsing John McCain RPV Chairman Jeff Frederick called him a maverick. Well, guess what, Mr. Chairman? I don’t want a maverick, I don’t want a liberal, and I don’t want a moderate! I want a constitutional conservative. 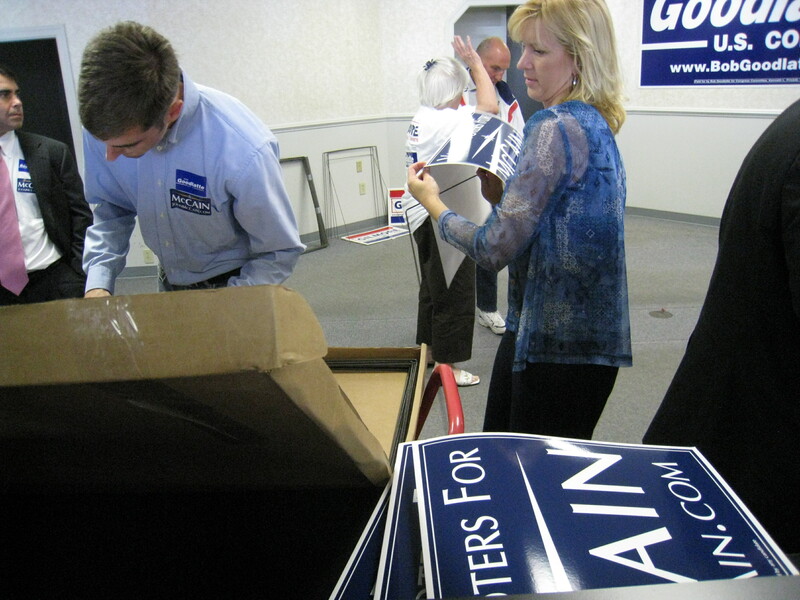 A number of local conservatives have recently thrown their support to McCain as a result of his choice for vice-president, Alaska Governor Sarah Palin. 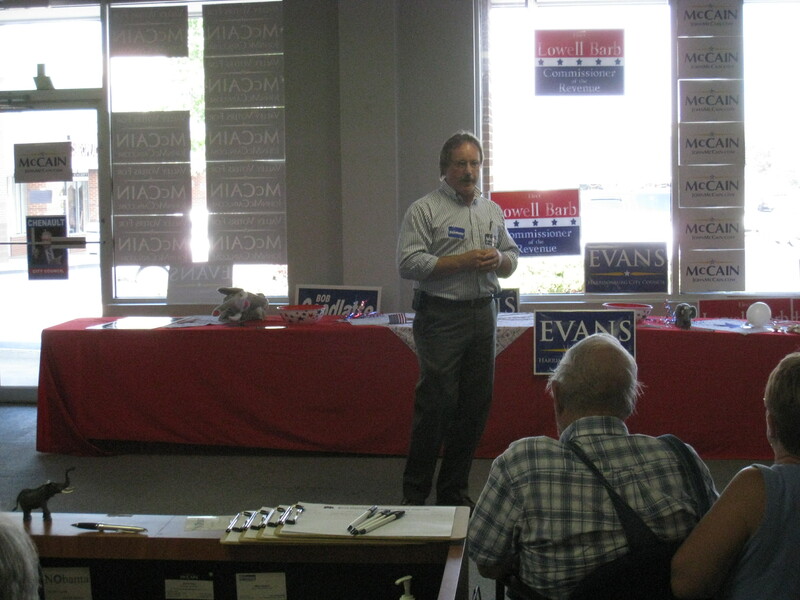 For example, at our local city/county GOP gathering, the county chairman stated that although he knew that many of us did not care for McCain, we should vote for him in 2008 so that we can vote for Palin in 2012 or 2016. It is a sad reflection that more people are excited about Palin than McCain. I have never voted for a presidential candidate based solely upon his vice presidential choice. From what I’ve learned thus far, although I think Palin would be an acceptable conservative, John McCain is not. Also, McCain is running for president, Palin is not. The vice presidency is worth very little. Therefore, as a principled conservative, I must reject the McCain/Palin ticket. I highly recommend listening to Jack Hunter’s commentary on the subject of McCain/Palin found here. But Joshua, you might say, John McCain is a conservative. He is solidly pro-life and is against pork barrel spending. Although both are conservative stances, those viewpoints alone do not make him a conservative. Need proof? Consider his position on illegal immigration and his support for amnesty. How about his support for big government solutions in “solving” global warming? Then there is the whole McCain/Feingold issue. Do you honestly believe that this bill does not violate the 1st Amendment? Remember that McCain voted against the Bush tax cuts and supports the death tax. He also advocates a very interventionist foreign policy. It amazes me greatly that so many so called conservatives derided Bill Clinton’s efforts to be the world policeman and nation builder but so readily embraced the exact same policies under our current Republican administration. You should expect more war and nation building under a McCain presidency. Oh goody! For these reasons and others, one can see that McCain does have conservative tendencies, but is far from a conservative. When it comes to comparing John McCain to Obama, some conservatives argue that we should vote for John McCain because he is the lesser of two evils. If you buy this line, you must accept the fatal flaw in this line of thinking, which is that voting for McCain is still evil, just not as much. I’ll choose no evil, thank you very much. Others say that we should vote for Obama in order to teach the GOP the lesson that they cannot nominate non-conservatives and hope to win. Although I don’t want liberal Republicans, I cannot support liberal Democrats either. Liberal under either party is still liberal. Another option is to stay home and not vote, but I believe that to not vote is a failure of one’s civic duty. What’s a conservative to do? As for myself, I plan to vote for a third party candidate. Naysayers will claim that voting third party is throwing your vote away, but it is far better to support a cause with which you agree even though it will almost certainly lose than to support a winning cause you despise. No doubt some fellow Republicans will brand me a traitor, but principles are far more important than party. After all, without principles what is the point of the party? My line of thinking is far closer to the stated goals of the Republican Party than Senator McCain’s. Besides, with two prior exceptions, I have always voted Republican. These two variations occurred when Republican candidates betrayed or forgot about their conservative constituents, the 2002 Senate Race (Warner) and the 2004 Presidential race (Bush). In both cases I did not so much vote for another candidate, but rather against the Republican one. I should mention that I did not vote for either of the two Democrats (Warner or Kerry), as I felt they were not worthy of my vote. Maybe one day I’ll find a conservative Democrat running against a liberal Republican. Like they have in some states, if they offered a “none of the above” option, it would get my support. If you saw the interview yesterday, Ron Paul mentioned that Americans should vote for a candidate who supports four key principles. These principles are ending interventionism and militarism in foreign policy, restoring privacy in part through getting rid of the Patriot Act, eliminating the national debt, and abolishing the Federal Reserve. Therefore, he could realistically encourage voters to vote for Bob Barr (Libertarian), Chuck Baldwin (Constitution), Cynthia McKinney (Green), or Ralph Nader (Independent). Ron Paul is only partially right here. Although they all apparently endorse these principles, I could not in good conscious support either McKinney or Nader. Until and unless these two embrace the ideals of the 10th Amendment and a limited federal government, they are as unacceptable as McCain and Obama. Instead, they support proposals like reparations and national health insurance. Therefore, the true choice for conservatives is between Barr and Baldwin. I wish that I could support the Republican ticket this year, I really do. To stand in opposition puts me at odds with a number of friends and associates. 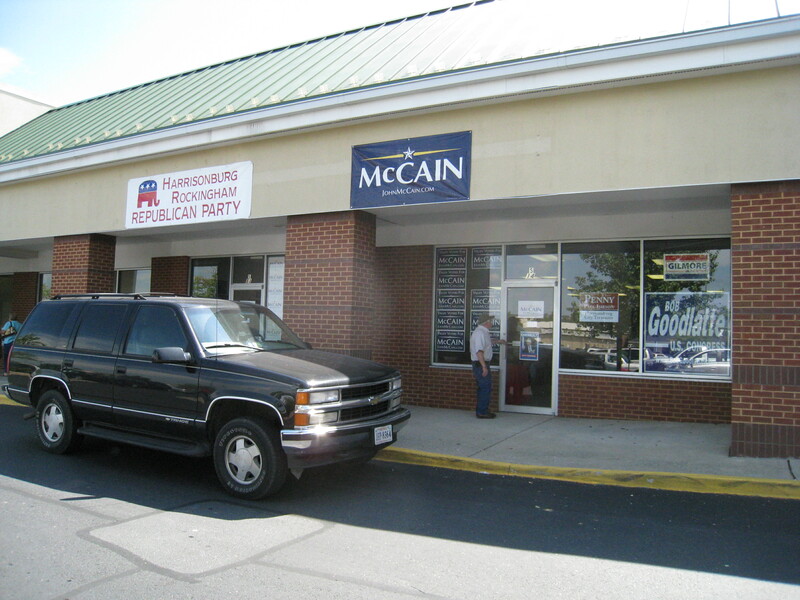 You see those McCain signs that say “country first”, but it misses the greater issue. Without putting principles first, neither country nor party holds nearly the same worth. I am a conservative first and also a Republican as long as they hold the same values that I cherish. 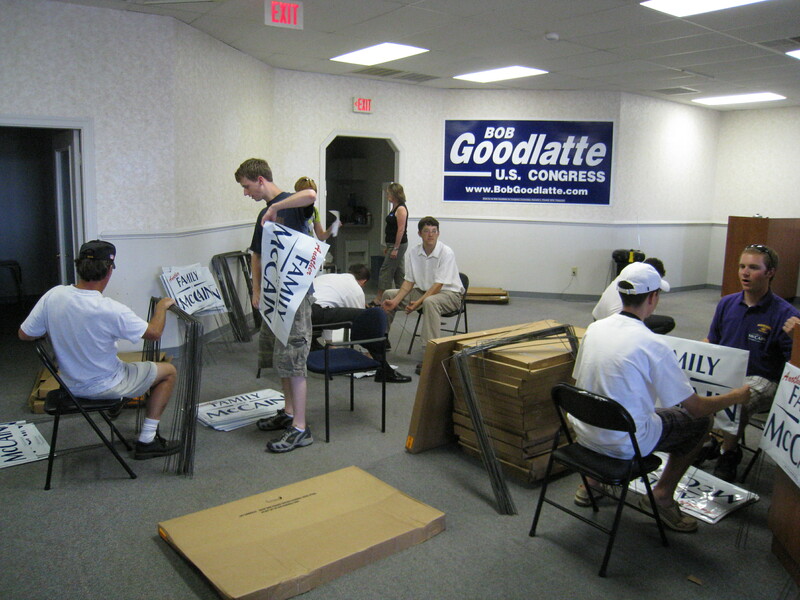 Let us hope that the party nominates a solid conservative in 2012. When they do, I’ll be the first to sing the praises. Until that day, we must not allow ourselves to be taken for granted any longer. Well, the time is upon us once again. What time you might ask? True, it is football season, but also important is the official start of the election season here in Harrisonburg and Rockingham County. Although we have our annual booth at the fair (if you’ve never experienced it, you really should), the true start to the season begins with the opening of the city/county Republican Party Headquarters. 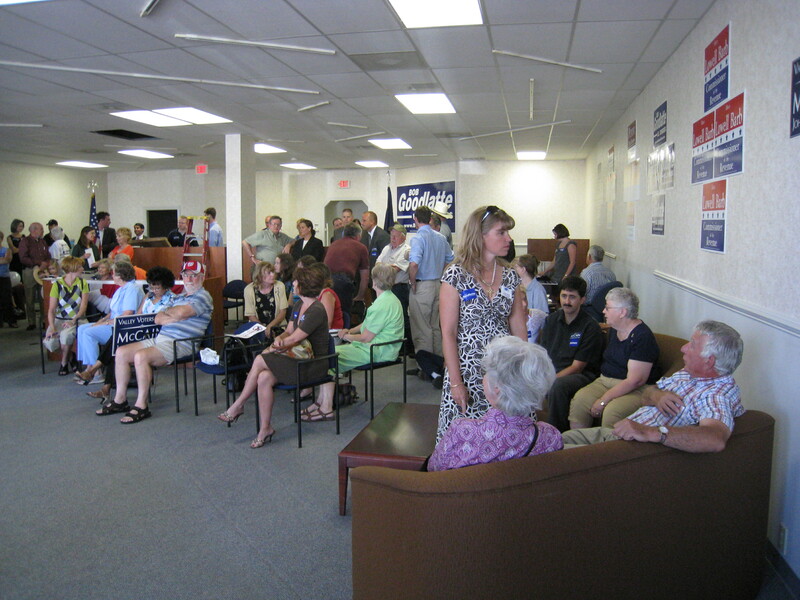 On Friday, after the usual gathering at the Wood Grill Buffet, we met at our new headquarters. This year, like many in the past, it is located in the same shopping center as Heavenly Ham behind the Valley Mall. It is a good location I think. Although I do enjoy the charm offered by a downtown setting, the parking and proximity to many places of business make it more accessible. Though to be honest, as long as we aren’t in the former tattoo parlor on route 11 as we were in 2006, I think we are doing pretty well. 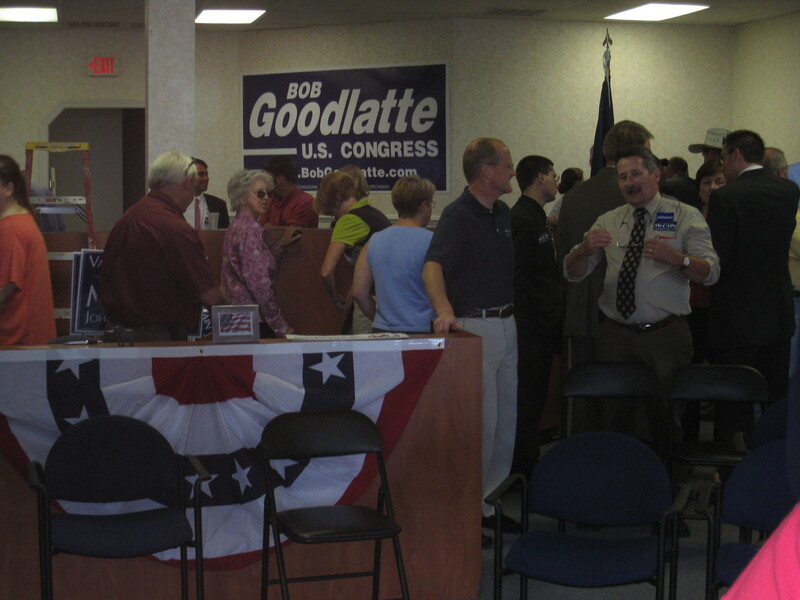 Our own Congressman Bob Goodlatte was there to open the HQ, which was a nice touch. I wish our State Senator and Delegate could have made it too, but as for Senator Obenshain, I was told he had to attend to his attorney duties at that time. It was certainly understandable. 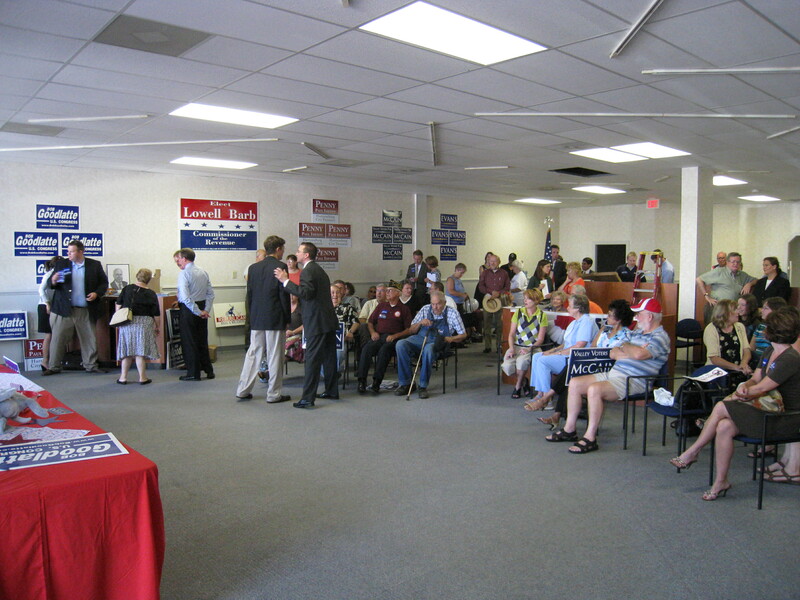 It looks as it we will have a goodly number of people in the building at most hours of the day as one desk appeared to be set aside for an RPV staffer and the McCain campaign has sent one or two employees to work out of the location. It is a smart move I think. Certainly this area is fertile ground for likely Republican voters and John McCain would likely need strong majorities in this region to counteract northern Virginia. But, what would this post be without pictures? Enjoy! Last year, before I worked for the Ron Paul campaign, I spoke to Virginia candidate about his upcoming race. He was searching for a campaign manager and thought I might be a good choice. As part of the interview process, he asked me for a writing sample. I wracked my brain, but I couldn’t think of anything I wanted to send him. At the time, I was working primarily on fiction and didn’t want to send him my work. After all, if I couldn’t convince an agent to publish the work, how could I impress him with the same material? Alas, much of my political writings were outdated, a remnant from college. Therefore, I decided to create something new…something that highlighted a very important topic to me, U.S. foreign policy. I labored for a handful of hours on the piece and then submitted it to the candidate. After he was finished reading it, he asked if I had ever had this work, or something on the same topic, published. I told him that I hadn’t but, intrigued, I asked him why he wanted to know. His reply was quite blunt. He told me that if I had, he would certainly not consider me for the position. It was not so much how it was written (although I think I can improve upon it), but rather the beliefs that I held. Nevertheless, he later offered me the position assuming I agreed to not discuss this issue further, but I declined to accept. Well…I’ve kept you in suspense long enough. Here is my writing, as it was sent back in 2007 (with one and only one spelling correction) in all its scandalous glory. Enjoy. “Although I know that I differ greatly with other Republicans that I know, (and my position could cost me personally) I feel compelled to write about the important issue of the conflict in Iraq. Although I think that just about everyone agrees now that the military strategy was mishandled, the larger question we should be asking is, should we have been over there in the first place? I think the answer is no. If the reader is to recall, after 9-11 and the conflict in Afghanistan, Americans awaited news of the capture of Osama Bin Laden. Certainly any person responsible for the horrid attacks on the world trade center and related targets must be held accountable. As the sweeps of the caves of Afghanistan proved, Osama was a difficult target to catch. It was, during this time, that strong rhetoric from the White House called for the removal of Saddam Hussein. They claimed that he was a threat to national security for he possessed weapons of mass destruction which he was intending to use on the United States, and that he aided to some extent in the 9-11 attacks. If these arguments were correct then certainly one could make the claim for an attack on Iraq. There was just one small problem. As I suspected then, and most everyone now knows, these two premises for conflict proved to be false. Once this realization was made public, the reasons for conflict supposedly changed, stating that instead we wished to free the people of Iraq from the tyranny of Saddam and work to protect the free world and democracy. Although these goals sounded lofty, neither is a proper use of our military. I believe that it is an extraordinary act for a man to lay down his life for his country as our soldiers do, and, in accordance, we should not and must not ask him or her to do so lightly. If, and only if, our people are truly in danger, should this request be made. As events planned out, it was shown that such was simply not the case in Iraq. Although perhaps sounding harsh, the life of just one American soldier is worth more than the supposed freedom of the Iraqi people. That is not to say that I do not support the freedom of the Iraqi people, because I do, but such a movement must come from within, not be delivered by a foreign power. On another point, one can point to the Constitution rightly claiming that it is our government’s responsibility to protect the citizens of this nation from all threats. One cannot find where it is allowed the same power in regard to the citizens of another sovereign nation. I do not understand how supposed conservatives can embrace the policy of nation building when such a power, to the best of my knowledge, is not enumerated by the Constitution. Are we not strict constructionists? Do we not believe, with a couple exceptions, that the best government is that which governs least? Do we not understand that a continued policy of foreign interventionism, such as the one in Iraq, vilified the United States in the eyes of many, had the potential to create new enemies, and ultimately served the opposite goal of weakening our security? In September of 2000, before 9-11, President Bush spoke against the policy of nation building. I think he phrased it well when he said, “I just don’t think that its the role of the United States to walk into a country to say, ‘We do it this way, so should you. '” It was greatly unfortunate that, as a result of the crisis, this earlier wisdom was abandoned. So what do you think? Shocking isn’t it? Despite the fact that a significant majority of Americans agree with my viewpoint, holding such beliefs makes one a quasi-pariah in the Republican ranks. To give you some additional information, the candidate from above mentioned that my writing was more akin to a Democrat that a Republican. Now, I can’t recall the last time that I heard a Democrat call for a limited, constitutional government, but maybe I just missed that somewhere along the way. Let us not forget that the first conflict which called for making the world “safe for democracy” was waged not by a Republican, but by a Democrat, Woodrow Wilson. Nevertheless, I know that a great number of Republicans, even many who consider themselves conservatives, hold a differing viewpoint that I do on the issue of foreign policy, but I think it is quite sad that they are not open to discuss this issue either openly or in private. You think not? For example, several months ago while at a Harrisonburg GOP function, Bob McDonnell stated that Republicans disagree all the time, but if we agree at least 80% of the time, we should be united and work together. He then went on to say that we must continue to support the war in Iraq. Was his discussion about unity merely empty rhetoric? Come on Attorney General…I agree with you on more that 80% of the issues, why must I be forced to sit quietly in the corner? Is this issue not up for debate? Have the neo-con hawks kicked the rest of us out of the party? Oh well. Life goes on I suppose. The fight for the party as well as the fight in Iraq goes on. We can’t let them win that easily.